Recombinant Bovine interferon γ (PBP007) used to stimulate bovine endothelial luteal cells in vitro prior to metabolite analysis by PCR and western blotting. mRNA and protein expression for selected aa metabolites in non- and cytokine treated EnCL-1 cells. LTC4 synthase, LTA4 hydrolase, PGE2 synthase, PGF2α synthase and EDN-1 (A) mRNA, (B) protein expression of non-treated and cytokine (TNFα/IFNγ) stimulated EnCL-1 cells and (C) representive immunoblots of studies factors: 1 lane: Positive Control-bovine lung tissue, 2 lane-Control, 3 lane-TNFα/IFNγ. Arrows indicate statistical differences in the respective mRNA quantitative expression between groups of non-treated and cytokine treated cells (P<0.05), as determined by one-way ANOVA followed by t-student's multiple comparison test. From: Korzekwa AJ, Bodek G, Bukowska J, Blitek A, Skarzynski DJ. Characterization of bovine immortalized luteal endothelial cells: action of cytokines on production and content of arachidonic acid metabolites. Reprod Biol Endocrinol. 2011 Feb 24;9:27. Recombinant Bovine interferon gamma, (IFNγ), known previously as macrophage activating factor, belongs to the type II interferon family and is produced by T lymphocytes and NK cells. Native bovine interferon gamma is a 143 amino acid cytokine with potent activating, anti-viral and anti-proliferative properties. It is produced as a pro-peptide with an additional 23 amino acid N-terminal signal peptide sequence having a molecular weight of ~20 kDa. IFNγ is predominantly secreted by activated T lymphocytes in response to specific mitogens as a result of infection and has numerous immunological regulatory functions. Properties include macrophage activation, upregulation of MHC class I and II molecules on various cells and induction of cytotoxicity. Floss, M.M. et al. (2010) Expression and Immunogenicity of the Mycobacterial Ag85B/ESAT-6 Antigens Produced in Transgenic Plants by Elastin-Like Peptide Fusion Strategy. J Biomed Biotechnol. 2010: 274346. Korzekwa, A.J. et al. 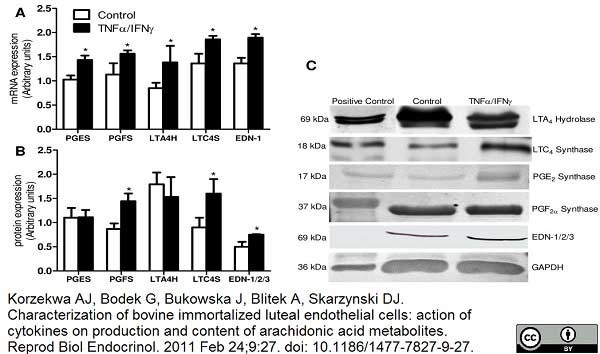 (2011) Characterization of bovine immortalized luteal endothelial cells: action of cytokines on production and content of arachidonic acid metabolites. Reprod Biol Endocrinol. 9: 27. Pujol, J. et al. (2015) Generation of a soluble recombinant trimeric form of bovine CD40L and its potential use as a vaccine adjuvant in cows. Vet Immunol Immunopathol. 168 (1-2): 1-13. Soria, I. et al. (2018) Immune Response and Partial Protection against Heterologous Foot-and-Mouth Disease Virus Induced by Dendrimer Peptides in Cattle. J Immunol Res. 2018: 3497401.